If you're keen to get extreme, then this brand new Xtreme Playzone is the destination to get your game on. Whether you're a kid or just a kid at heart, this exciting new gaming centre has got something for you. Xtreme Playzones main attraction is its spacious Laser tag arena, with your very own flashing vest and laser gun to take down your opponents. The laser tag arena is decked out with black lights and its very own laser show to amp up the energy in there. You can have as few or as many people playing on your teams as you like, with up to 30 people able to play at one time, so there'll be plenty of targets. 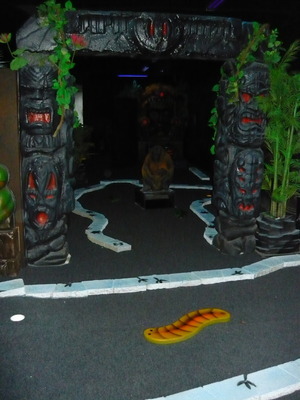 Once you're done beating everyone else at laser tag, you can hit the black light 9 hole mini golf with an exotic, jungle theme, complete with wild animal obstacles. 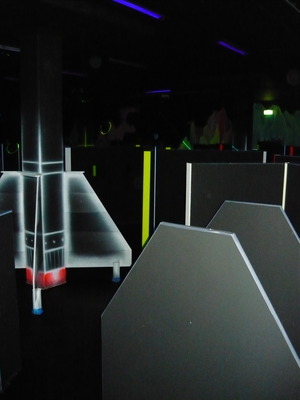 For a bit more friendly competition or just for your own kicks, there is "Laser Frenzy", which is a room filled with laser beams that you have to weave your way through as quickly as you can and try to hit as few laser beams as possible. For the bigger kids, there is also 4 player Daytona Racing and a Rambo first person shooter arcade game, as well as skill testers and the game that created a super fad, the interactive dance arcade game. Another enjoyable activity is the bumper cars, especially since each car has a special spot on the side, that when another person hits it your seat will spin around and around, muchos dizzy. Bumper cars, so much fun. This venue has a café for you to refuel at after all the running around, with plenty of seating and also offers Pizza Parties in their themed party rooms such as jungle, space and under the sea for the younger folk. For the really young kids, there is a large soft play structure to keep them occupied with lots of space for mum or dad to keep a watchful eye over them. It really does have something for everyone, and I for one know how much fun can be had. I've been here, it was awesome! $25 got us a go at everything and we were there for over 2 hours. We're definitely going back soon with more people. It was a great night. amazing place!!!!!! great pizza great night for dinner and laser tag! be there or be square its amazing! Great way to spend the holidays for the kids! Fantastic family fun. Loved the place and the pizzas.